An intense women-centered drama that explores with great humanity and sensitivity such difficult topics as race relations, skin bleaching and abortion. Based on a novel by Whale Rider writer Witi Ihimaera, White Lies - New Zealand's entry in the 2014 Oscar competition for best foreign-language film - is an intense drama that explores with great humanity and sensitivity such difficult topics as race relations, skin bleaching and abortion. Paraiti is the healer and midwife of her rural, tribal people - she believes in life. But new laws in force are prohibiting unlicensed healers, making the practice of much Maori medicine illegal. She gets approached by Maraea, the servant of a wealthy woman, Rebecca, who seeks her knowledge and assistance in order to hide a secret which could destroy Rebecca’s position in European settler society. 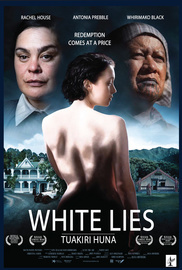 This compelling story tackles moral dilemmas, exploring the nature of identity, societal attitudes to the roles of women and the tension between Western and traditional Maori medicine.